MasterBay S, Patch Bay from SPL. "Traditional patchbays are very useful to distribute signals. However, when it comes to mastering, many engineers wish they had more flexibility: even for experienced users a simple comparison of different processors or processing paths can become a nightmare. " 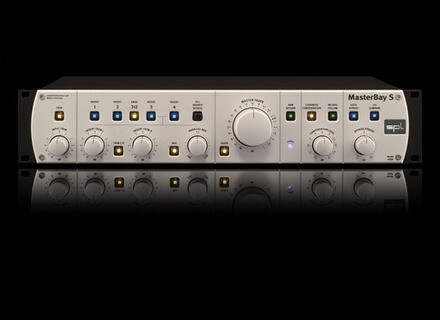 The MasterBay S is designed to let you manage up to four stereo processors. Its flexible switching matrix and unique listening comparison possibilities make it easier to get the best results out of the available equipment. The user can set freely selectable intervals for automatic A/B comparisons. And it is also possible to compensate for loudness disparities to be able to compare only the actual sound differences, while the Parallel Mix function determines the balance between the dry input and the processed signal. The MasterBay S features Trim potentiometers to fine adjust all input and output levels plus a central knob that serves to adjust the record signal's dynamic fading. Being a processor interface, the MasterBay S reduces signal conversions to the strict minimum, regardless of the number of processing units connected, the company says. The price of the German designed and manufactured unit has not been announced yet, but it will be disclosed during the Musikmesse in Frankfurt, Germany, where SPL will be in stand B 82 in Hall 5.1. [NAMM] Behringer Digital Snake S16 Behringer introduces the S16 I/O box with 16 remote-controllable mic/line inputs, 8 outputs and AES50 networking.